XBoard's Double-Sided Mobile Dry Erase Board gives you double the space to write and display visual aids. 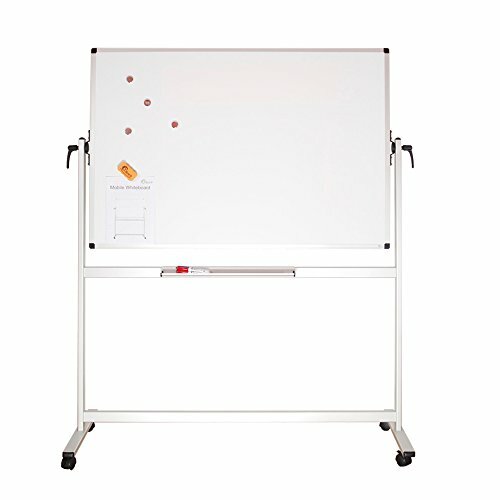 This mobile board comes with a magnetic dry erase board surface on each side. To switch sides, just rotate the board and secure it in position with handle locks. Comes with a removable accessory tray that keeps markers and erasers close at hand. This versatile markerboard rolls on casters, so you can easily move it anywhere in the room. 4 locking castors to easily roll your dry erase board from one room to another. Once in place, push the lever with your foot to keep the board firmly in place for use.